The same day I was wondering what had become of Seven Witches, my advanced digital copy of Call Upon the Wicked arrived in my Inbox. Founder and guitarist Jack Frost returns once again with vocalist James Rivera (Helstar) and new crew members bassist Mike LePond (Symphony X) and drummer Taz Marazz. Call Upon the Wicked finds the band in excellent form offering traditional heavy metal. I'd even propose it's the likely Seven Witches most accessible and ambitious disc to date. Those last comments come entirely from the dynamic song compositions, which offer more than screaming vocals, heavy riffs, and a guitar solos, and the marvelous musicianship. Ragnarock is a sterling example of this. Rivera betters himself with more varied vocals performance against the background of solid background vocals. The bass work is quite forward and vigorous as is the Marazz's drumming (more on this in a moment). And Frost rips off more than a few classy solos. All theses things are wrapped up a great melodic groove. The large part Call Upon the Wicked resounds with this entertaining dynamic. Fields of Fire tempers the motif with heavier metal. Call Upon the Wicked adds an up tempo rock feel to the metal creating a catchy groove akin to what Judas Priest so easily does. Yet, Seven Witches mixes it up with more diversity. Both Mind Games and Harlot of Troy hasten the pace adding speed to the heavy metal cauldron. The premier track maybe the longest, End of Days. It's ambitious, with twists and turns that rise from each player's participation in the arrangement. Seven Witches also includes a Cream cover: a heavy metal version of White Room. Some will undoubtedly defer to the original. To the musicianship once more: this could be Seven Witches strongest line up to date. Little needs be side about the excellent skills of bassist Mike LePond (Symphony X). However, throughout Call Upon the Wicked I was drawn to Taz Marazz's fine and accurate drumming. Standout tracks for his work include Lilith, Call Upon the Wicked, Ragnarock, and End of Days. Call Upon the Wicked closes with three live numbers, and I guess we should consider them bonus tracks. These include the more popular Seven Witches numbers Metal Tyrant from Xiled to Infinity, Metal Asylum and Jacob from Year of the Witch. The latter integrates Judas Priest's Victim of Changes. Considering the shaky sound quality, I think I would have liked some more new tunes. Nevertheless, they're still a nice addition for the fans. 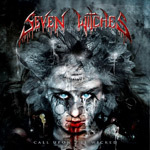 Call Upon the Wicked finds Seven Witches in prime form delivering some of their best, and most accessible, traditional and melodic heavy metal in their career.